I confess that I've been afraid to blog for Krista. I know a lot of you aren't crazy about me because Sophie and I divorced. Don't start yelling at me, please. It just happened. We were both so busy, and we went our separate ways. We're still good friends. Maybe better friends than when we were married, actually. I chalk that up to being a little older and wiser. Did you know that Natasha and I aren't married? I've heard Sophie say that Natasha and I set up housekeeping together. That's a funny way to put it. I don't know what it's really called. Significant others? Coupled? My mother calls it shacking up and uses a tone of unmistakable disapproval. She never pushed me to marry Natasha, though. I suppose Mom never forgot about Natasha trying to put her in a nursing home. Those two never did get along. It's another super busy year for me because of the elections. As a political consultant, I'm out of town more than I'm home these days. The curious thing about being away from home is that it puts things in perspective. I don't know why that happens. You'd think it would be the opposite. Maybe the air just clears. I don't dwell on my personal life very often. Bernie thinks that's because I'm a guy. Who knows? Natasha broke my leg a few months ago. She felt pretty rotten about that and built me the most unbelievable man cave I've ever seen. As it turned out, it was probably a good thing my leg broke (never thought I'd say that! ), because I bunked over at Sophie's house and was able to help her in The Diva Steals a Chocolate Kiss. Yeah, sometimes the dust settles when you're away from home. I feel like I can see everything more clearly now. It's time for me to finally do the right thing. How about you? Have you ever gone away and realized what you needed to do? 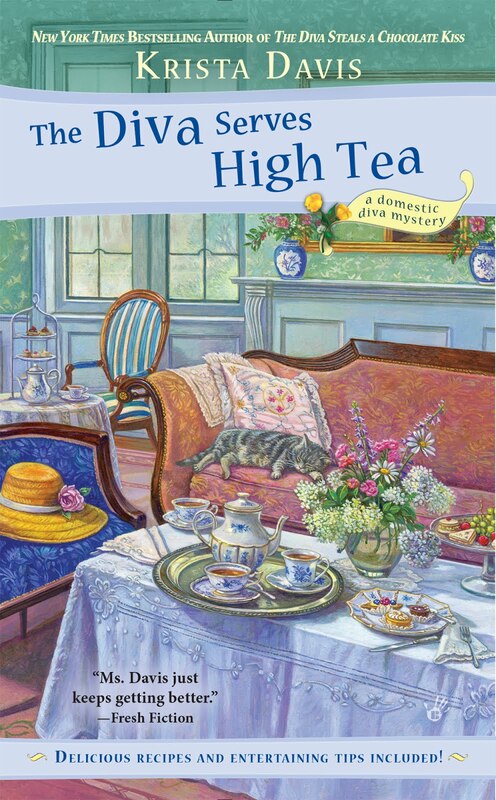 To coax me into blogging today, Krista said I could give away a copy of THE DIVA SERVES HIGH TEA. Leave a comment with your email address, please, so Krista can contact you if you win. Good Luck! Sometimes it helps to take a step away from everything in order to focus and see the situation with "fresh" eyes. (I have done that.) I can't wait to see the new adventures in Diva series! Thank you for the giveaway. Mars!! I really haven't had to use going away to gain perception, but there are things I'd like to avoid. Like lawn mowing. Thanks to you and Krista! Can't wait to see what the right thing will be. I have some thoughts, but I'm sure they won't materialize! Normally I go away to forget all the things I have to do and I'm too damned tired to do them anymore. I have been such a big fan of this series from the very first sentence from the very first book! I always look forward to Diva adventures! I love both series. They have brought me much entertainment during a rough period of my life.Thank you!!!! I have a couple of friends that had a not so good marriage, but their friendship is wonderful. Just happens that way sometimes. This book sounds awesome!! I can think of one incident. I had a disagreement with my son in the morning right before I headed out to do Christmas shopping. I stayed out as long as I could because I was so hurt. On my way home I still didn't want to face the situation so I pulled into a track of new homes that were unoccupied. After a few minutes a car swooped up driven by a security guard. He asked what I was doing there. I told him I had been shopping all day and just needed a few minutes to regroup before going home. I guess he could tell I was upset and said do you want to talk about it? I said I'm fine. He said are you sure, I'm a good listener. Suddenly I just wanted to get home, the last thing I needed was therapy from a security guard. I restated that I was fine. He left and I quickly started my car and drove home. I was so embarrassed. There's a happy ending though. When I pulled into driveway my son came out, gave me a hug and apologized. Everyone was wondering where I was because I came late, boy did I have a story to tell them. Sometimes when you really, really, really don't want to do it, then you know it's the thing you must do. Can't wait to see what you have decided you must do, Mars. Thanks for the giveaway. I have read some of the other books in this series and really enjoyed them. Can't wait to read this one. Very excited.... thank you for the chance to win. I always have to remind myself to take a breath, step back, and look at the situation again. Thanks for the contest. Sometimes just taking a walk to clear my head helps me see a situation from a different perspective. Thanks for the chance to win a new book. Kay, ksarginson@tampabay.rr.com. I love your books, can't wait for this one! I want a new one every month (not possible, right? Ha!). Sounds like another winning read. Sometimes you need to slow down and reevaluate! I definitely find that stepping away from a problem makes you see things in a different way. I absolutely love this series! Thanks for the chance! Stepping away from a problem really helps. If you're able to take a step back and reassess your options, you can make a better choice. High tea sounds great. I could use a snack. I have a few books in this series. I think going away gives you the time to think and decide what you really want to do without having to try to block out the "incessant advice" from others telling you what they want you to do. I have only done it for a few hours at a time, never longer. I would love to win and my email address is DebraCarmichael@bellsouth.net. Sometimes when things just aren't going right, you have to take a break and walk away from the situation and things usually work themselves out. Looking forward to reading "The Diva Serves High Tea". Love this series. Walking away from a problem gives you a chance to get a new perspective. Can't wait to read "The Diva Serves High Tea". This is Janet Cookston Colgrove's entry. She's having trouble getting in. This is Andrea Stoeckel's entry. The system thinks she's a robot. I've never really physically gone away, but I have done something else for a while and tried not to think about the problem for a while. Then coming back with fresh eyes sometimes makes things more clear! I think better when I talk it over with Friends who have some experience of what I need to do... also a good meal out helps..wonderful sounding book..
Time away can put things into perspective. I'm happy that Natasha build such a nice man cave for you. But is she trying to buy your love? One night I had had enough of ungrateful teenagers (there were five at home that summer) and I finally just stormed out of the house and drove away. I would have left the family that night. But I wasn't wearing shoes and hadn't taken my purse. After driving for a little while, I realized I needed to be there for our much younger son and and I really could deal with the ungrateful aliens that lived in our house. Now they are my best friends, second only to my husband. I am so glad I went back. Have you really put things in perspective? Perhaps you are more confused then ever.Mars what a wuss. Left my marriage (twice) and had second thoughts. I like to think about things after I walk away from it. It helps a lot. I love this series and I can't wait to read this one. Thanks for the chance! My favorite book?I find that an impossible honest answer. I love those books. I even love Kristas' other series! I would be honored to win this book and get to review it. As usual I want to make sure I say....let's not forget the extraordinary person Krista Davis is. How many authors go out of their way, to stay in contact with their readers? Always look forward to a new book. Good luck to you whatever the future holds! Krista, I love all of your books, I would love to receive a copy of this one. It looks and sounds like a really interesting one. When things get rough around here, I take my two grandchildren and go shopping until we drop! We all have fun and forget about any problems at home, especially if we go the Crayola Factory or American Girl Store for Lunch. Can't wait to see what Mars is up to in this one. Hi, thank you for the giveaway. this looks like a fun series, one I would enjoy a lot. Hope I win t his book, then I will "have" to order the rest of the series. Thank you all so much!!! Our winner today is Niblet! If you didn't win, keep trying. There will be many more giveaways. Yay! Would love to win! Pucsbride13@gmail.com. thanks! Such a fun giveaway opportunity; thank you! Great series! Thank you for the opportunity to win a copy! Oops! No email address! davisel1830@hotmail.com! !